In this nonfiction graphic novel, writer/illustrator Brown ( Andre the Giant: Life and Legend) sketches the history of individual and societal responses to, uses of and attitudes toward cannabis in broad strokes, from humanity’s first contact with the plant and its place in East Indian mythology to the present. Unsurprisingly, most of Brown’s latter-day history of cannabis involves its demonization by the U.S. government to subjugate minorities and for political gain, especially by Prohibition advocate Harry J. Anslinger, the U.S. Treasury Department’s Federal Bureau of Narcotics first commissioner, described by Brown as “cannabis’ greatest enemy.” Readers are advised to supplement their reading of this text, the typos in which need another round of copy editing [advance uncorrected proof provided for review], with other, more strictly objective works (e.g., Owlin’s How Do You Smoke a Weed [Xpress Reviews, 11/2/18]); some violent, disturbing content but suitable for young teens and up. 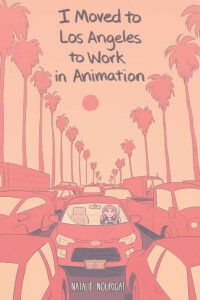 After seeing her friends in the Portland, OR, comics scene make the leap to animation in the City of Angels, Nourigat (Between Gears) decides to take the plunge herself. This part how-to, part memoir shows the artist embarking on the journey of finding a job, a home, and her peace of mind in a new city and career. Although the content is aimed at a specific occupation and locale, the overall message of pursuing one’s dreams and thinking outside the box in terms of career choices serves as a helpful nudge for all kinds of readers. The opinions of other illustrators on the topic offer a variety of viewpoints that curious audiences will find stimulating. Charming and well-developed pastel-colored illustrations feature on pages that range from traditional multipaneled layouts to full-page scenes and every variation in between.